yo draw through all 3 loops. Pattern Row - ch2, dc2tog in each dc2tog to end, 1dc in top of ch2. Turn. You will have worked 12 rows in all or your work measures approx 6 inches from beginning. Fasten off. Fold hat in half width ways, with WS facing using a 6.00mm hook, sl st the cast on chain together loosely or over sew together using a needle and yarn. Fasten off. work 1sc in each sl st to end. (50sc) Fasten off. Make 2 pom-pom's in color of your choice. 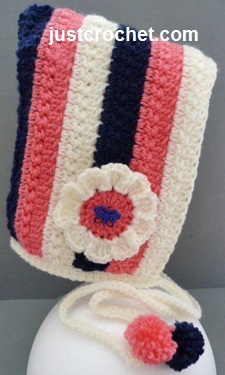 I used Clover Pom-Pom maker size 25. Finishing - Weave in loose ends of the ties to the hat, weave in all other loose ends, attach pom-pom to each tie end and make a bow. Finishing - Weave in any loose ends of yarn. Attach flower to hat. Placement and button in center is your choice. Hope you enjoy this free pattern for a pixie Hat.